The St. James Lighting Quebec copper lantern is so versatile, it will match any décor and warm the entrance of your home or business with radiant light. A beautiful teardrop adorns the top for a finishing touch. By versatile we mean versatile with 5 size options, 16 colors or finishes, 4 glass options, 6 lighting options and 8 bracket or mounting options! Wow. Are you ready to start building your own custom copper outdoor lanterns for your front yard, home or backyard entertaining areas? Custom design your own copper lantern lights so that they will make a big and bold statement and impress all who see them. Copper lantern lights that are second to none! The St. James Quebec Copper Lantern will do all that and more. 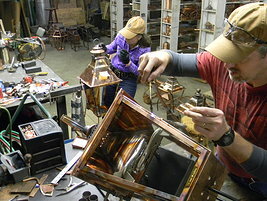 Quality and craftsmanship that is the "Best of the Best" in the copper lighting industry. Many use the Quebec as an outdoor chandelier in their outdoor entertaining areas for parties and gatherings. Home Designers continually call us from all over the country asking about our copper lights, and once they use them they ALWAYS come back for more because the highest quality products and craftsmanship are like restaurants with the best food, everybody knows about them and they're always busy. Our clients LOVE building their own personalized copper outdoor lanterns for their homes or businesses. They get exactly what they want, every time. We have the largest and only 4 prong open flame in the gas lanterns market. Not a 1 or 2 or 3 prong flame like the competition. It's the small details that make all the difference in life, right? Ok, here we go, let's start with the glass options; antique glass, seedy glass, water glass and clear glass. Now on to the sizes; mini, small, medium, large and Grande. Now on to the finish colors which are; Verdi Green, Raw Copper, Black Powder Coat (acid, matt, shiny), Light Patina, Medium Patina and Dark Patina. Wow, now that's a lot of colors and sizes to pick from and each finish color and size can change the overall looks and feel of your copper lantern light. Now the 8 mounting brackets to choose from; copper or steel wall mounts, copper or steel post mounts, ceiling yoke, ceiling half-yoke, pendant and wall yoke mount. And each different mount or bracket style can change the look and feel of your outdoor light fixtures! Hanging gas lights are very popular now and these mounting brackets will meet that need. So last but not least are the 7 lighting options and the lighting options you decide on are very important to the overall look and feel of your gas exterior lights. For great looking gas lights the 2 gas options gives an open flame that gives the lantern a more natural look. Choose from a natural gas or a propane gas flame for a romantic, soft light. With either gas option you will have a 4 prong flame and an ambient, soft look that is absolutely beautiful to look at. With the open flame option, you can also operate your gas lanterns with a light switch or other device. Most get the auto-ignition on/off option and put a timer on it so they have total control over when their gas lanterns come on and go off, also reducing gas usage. For people who prefer copper electric lanterns the electric options offers Edison Base Sockets for brighter lighting or a Candelabra Cluster for a beautiful soft glow and lower lights. Please check out all our great copper lighting fixtures before you leave our store including our beautiful copper gas lanterns, copper electric lanterns, copper outdoor lanterns, Coppersmith lanterns, copper lighting pendants, copper exterior lanterns, solid copper outdoor lighting fixtures, outdoor chandeliers, our great selection of copper outdoor hanging lanterns as well as our copper outdoor wall lanterns. So many great options for copper outdoor light fixtures to choose from as well as many great copper lantern lighting ideas to think about for your home. We just received our copper lantern - and what an amazing beauty it is!! The fact that the St. James Copper Lanterns are individually handcrafted is very evident with the quality and durability we see in this outdoor copper lantern. It is worth every penny we spent - and we were very hesitant to spend that much but the quality and great looks makes it very worthwhile! We love this "ONE STOP SHOP" website, you have all the options we needed - none of the many other websites we visited had all the options and the HUGE selection that we found here. Your fast and helpful service is very much appreciated too. And free shipping is so nice. Our new Quebec copper lantern is an amazing copper light! With all the options and features available from St.James, purchasing a copper lantern is like building our own outdoor copper light- which we LOVE, because we are custom designing and building exactly what we want for our outdoor lighting. And at a great price- we price shopped around enough to know.